Image from You and Mie. Halloween is a holiday many kids eagerly anticipate, and besides the candy, a big part of the fun is putting together their all-important costume. If you're inclined to go the DIY route, below are a mix of trendy and classic costumes you can make with your kids, no matter their age. At this age, most of the help you'll get is your child trying the costume on or picking out colours. If they have the attention span for it, ask them questions or show them what you're doing to get them involved. Pumpkin: This video tutorial shows you how to make a pumpkin costume from a t-shirt and a few other supplies. This version is easy to adjust for different ages/sizes. If you have a super young kid, you can use an orange onesie instead. If you want something more like what's pictured above, glue a pair of goggly eyes on the shirt or onesie. Moana: If you have some sewing chops, this video tutorial even includes instructions on making a string wig. For something simpler aim for the main colours and shapes of the character's outfit (red short sleeved top, tan skirt, and pendent necklace). Dinosaur: For an easy DIY costume, create this dinosaur tail and pair it with a shirt and pants in the same colour. Add a beanie with a few felt "spikes" sewn or glued on top and you have a proper dino! This tail is easy to detach so you can remove it as your kid gets tired during trick-or-treating. If none of these caught your eye, check out the all ages section at the end of this article for more ideas. Simple costumes are the easiest for young kids to help out with, especially if the costume has one or two parts the kid can do mostly on their own. Get your kid involved in picking the materials for the costume. Troll: If your kid is still singing songs from this movie, this is a perfect costume for them. Use this tutorial to get the outfits made and then go for an easier to wear option for the hair (as shown above). Tie strands of tulle around a headband, then gather them together with a bow. Lego: A classic costume that takes only a few materials, and is easy for your child to help glue and paint. This tutorial shows you how to go from start to finish on this simple DIY. If you have more than one kid, or your child wants to dress up with their friends, this is good costume to make for a crowd. 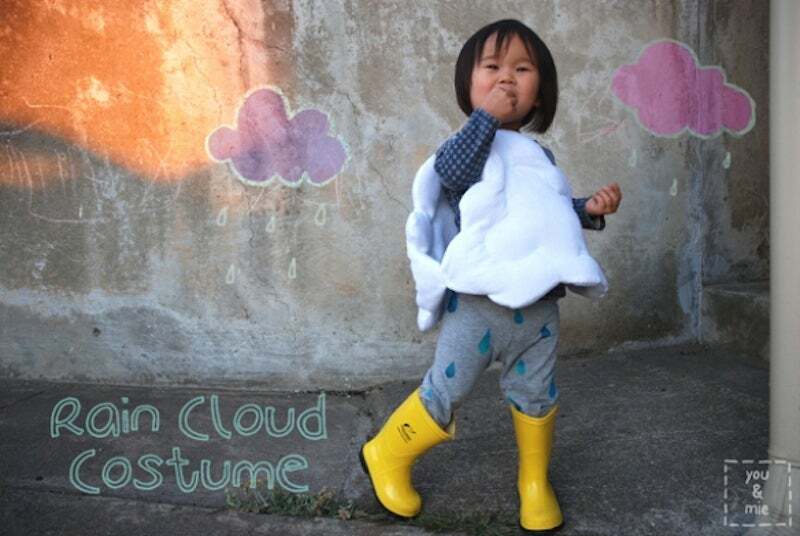 Raincloud: A quick and cute costume to pull together, this raincloud tutorial shows you how to create a costume with just a few materials. This is a great one if it will rain on Halloween in your area as rainboots pair perfectly. If you don't want to make a stuffed cloud, cut one out of cardboard, spray paint it white, and add a couple straps to the top to hang on your kid's shoulders. At this age, your kid can do a lot more to make their costume, with some help and supervision from you. Zombie: Give this video tutorial a try if you need help figuring out a zombie costume (it even includes makeup instructions). If your kid isn't into it, you can always simplify the makeup to white and black face paint with a little fake blood. Belle: The easiest way to make a Belle costume is to use a normal pre-made dress and add small touches to make it Belle-like. Here's a simple tutorial on adding an apron and hair bow to get her blue everyday dress. If your kid wants her yellow ballgown, try this video tutorial that turns an old wedding dress into Belle's gown. You can always use a yellow top and skirt or dress with tulle added underneath if you don't have the sewing skills or time for an elaborate DIY. Eyeball: For a simple, quick costume, make this "popped eyeball". It's kind of gross, easy to make, and fast to put on. Your teen might or might not be super into making their costume with you, but if they need help, here are some more complex costumes that could use two people to craft them. Stranger Things: Likely to be popular again this year, here's a video tutorial for a couple Stranger Things costumes your teen can rock. You might even be able to pull out a couple items from your own closet that they can wear to get the era right. Star Wars: Whether your teen wants to go for a classic Star Wars character or one from the more recent films, you can help them get the clothing pieces they need for the outfit, plus add any key details to make the costume come to life. Skeleton: Besides helping your teen get their skeleton makeup just right, you can make the skeleton body together, too. An eye for detail and patience are both needed for this costume. Some costumes work no matter your age. You can adjust the pieces of these costume to be easier to put together if you have younger kids. Pirate: All you need is a DIY pirate shirt, a sash, and a sword! Witch: Quick to pull together from black clothing your kid already has, or you can DIY a more elaborate costume. Buy a hat and a broom and your kid is set for Halloween. Wonder Woman: This costume will be popular this year, and you can either go detailed or aim for the general colour scheme with a blue skirt, red top with her symbol, and a faux crown. Cat: A Halloween classic and all you need is a black outfit, cat ears, and simple makeup. You can go more elaborate with a tutu or tail. Do you have a Halloween costume that you made with your kid? Share details in the discussion below so other parents can get inspired!